The Laguna Services team invests time in monitoring the market for new products and innovations in technology. This enables us to provide the highest standard of workmanship. Our renovation services have been rewarded with high recommendations in the private as well as the commercial sectors. We have finalised many large scale contracts thanks to referrals of this nature. Keep reading below to find out more about the renovations that we can offer you or your company. We have provided the services listed above to numerous establishments. This includes local guest houses, schools, nursing homes, office buildings, showrooms, and many more. Laguna Services continues to receive personal recommendations that are initiated by our regular customers. All enquiries are followed up personally. We’re here to offer our clients a fantastic range of paint colours and textures. Alternatively, we can also work with the paint that our clients provide us if they require a specific product for their personal preference. Laguna Services also operates a site management program that provides clients and employees with a single point of contact at all stages of the project. This means that our clients can input their ideas directly with the staff member who is carrying out that particular job, thereby eliminating any potential mistakes. From small patching jobs to multiple room refurbishments, Laguna Services covers all aspects of domestic plastering. We utilise the very latest in new internal plaster laying tools and automated sanding machines. Our skilled team members can complete your domestic plastering jobs much quicker than you thought possible. Our speed doesn’t compromise our efficiency – you will always get the highest quality finish with Laguna Services. 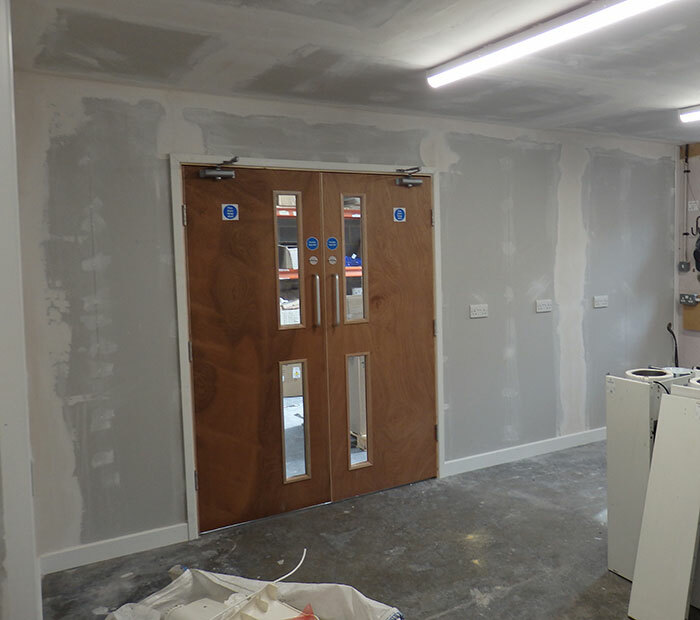 Looking for a team of accomplished professionals for a commercial plastering job? Laguna Services can handle any size of project. You will always benefit from a fully professional plastering installation. We install commercial suspended plaster ceilings, fire rated walls as well as removal solutions using Rondo systems. Our team uses their own scaffolding systems, which means that our clients can save time and money on transport!